← Fitting a New Hardscape to a Mature, Existing Landscape. 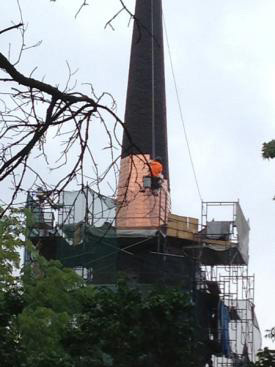 Steeplejack installs copper shingles over original decking. 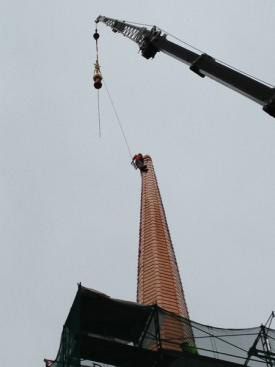 Steeple repair specialists are often faced with the results of long time deferred maintenance and optimistic maintenance and the First Congregational Church in Hudson, Ohio was no different. When CIS Steeplejacks of Litchfield, Ohio inspected the structure, their steeple had been having chronic leaking issues, and they sought to furnish a long term solution. Removing and replacing the original wood shingles with asphalt strip shingles 25 years previous had bought some time, but not as much as the Church had hoped. Depending on such maintenance intervals did not seem sustainable, so the client was open to consider more durable materials for such a remote structure as the church spire. They considered going back to the original wooden shingles, since they had performed well and because the structure of the spire was built to support them. 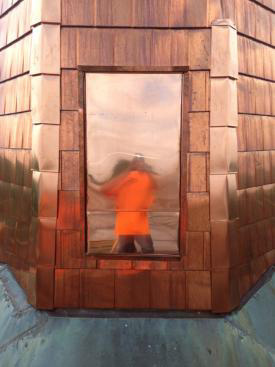 In the end, however, a copper shingle was specified. This type of solution permits movement of the spire and furnishes superior protection from the elements. The Church can now remove the spire from its list of ongoing maintenance concerns for the next one hundred years, at least. Locking, blind nailed copper shingles. 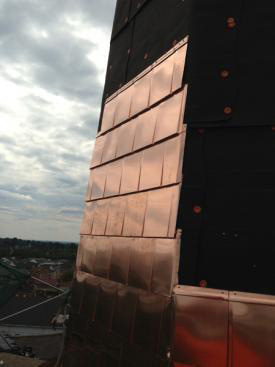 Copper clad access door, base of spire. This entry was posted in Steeples and Towers and tagged Church Restoration, Ohio, Roofing Slate and Tile, Steeplejacks. Bookmark the permalink.